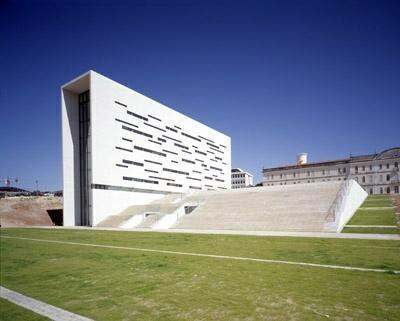 Located in Campolide, on one of the seven hills of Lisbon, the rectory building of Universidade NOVA de Lisboa, designed by the architects Manuel Rocha Aires Mateus and Francisco Xavier Rocha Aires Mateus, was awarded the Portuguese Valmor Prize for Architecture in 2002. The originality of this construction also resides in the fact that it has a staircase located at the side of the building which curiously does not lead to the main entrance. There are two openings in the staircase which lead to the Atrium. The end of the staircase leads onto a platform which functions as a covering for a significant part of the building, namely the two Auditoria, the Atrium, the Senate Room and the various support sections. The West façade of the building introduces offset rectangular openings on various levels, which, due to the abundant natural light, allow the interior to obtain a perfect balance between simplicity and effect.